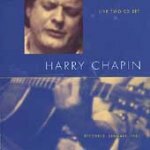 This 2-CD set captures the night of Harry Chapin's 2000th live performance in wonderful detail, from the intimate appreciation he had for his audience to their return enthusiasm for him. The sound quality is wonderful in that it captures the subtleties of Chapin's rough, blues-singer voice and the wonderful complexities of the accompanying music, while still allowing for the echoes and faint background noise of a small show for a faithful crowd. Really, the only way to describe this disc is intimate - Chapin shares the ups and downs of his life with the crowd with the bawdy candor that you'd expect more from some friend or relative performing at a family function than the musical legend he had become at that point. Ironically, Chapin ends the concert with a shout of "Here's to 2000 more!" to the crowd's fading applause - he was killed in a car accident on the Long Island Expressway nearly six months to the day after this performance was recorded.